SEE "RENTAL AGREEMENT" FOR ADDITIONAL REFUND POLICY TERMS. Location, Location, Location ... It's close to everything we enjoy ... shops, markets, snorkling, restaurants, golf, tennis, fabulous sunsets, an uncrowded beach with lots of sand, ocean kyaking, hiking, quaint towns, or just lounging around the exquisite pool. The high standard of construction quality is evident everywhere on the property and inside our condo. The pools, waterslide, lazy river, hot tubs, fabulous beach, and lots of uncrowed space to just kick around at your own unhurried pace make Hounua Kai a magical place! Duke's Beach House restaurant is just steps from our condo ... we can hear the soft live music in the evenings from our lanai. Our home in Maui is a truly special place ... luxury in paradise! 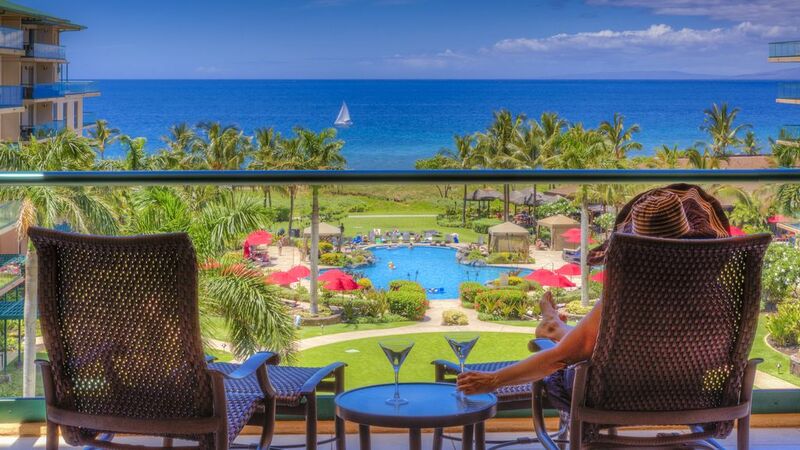 A Special Place to Kick Back and Chill ... We take our time to enjoy all of what Maui has to offer ... Whale watching (December - April) from the lanai. Chilling with freinds at sunset over Magharita's. Morning strolls on the boardwalk to Whaler's Village with a breakfast stop along the way. Grilling locally caught Ahi steaks on the poolside grill. Snorkling the wonderful reef just steps away, then sitting in the poolside hot tub ... very relaxing. Walking to one of the many local restaurants for a fabulous casual meal. Shopping at the local farmers market. Cooking wonderful local fish, fruits, and vegetables in our gourmet kitchen (how convenient that our son is a gourmet chef). Driving the Maui coast for uncompromising views of the ocean. The fragrant smell of fresh Maui air. It gets even better ... with so much to do, you can enjoy Maui at your own pace, taking in what you want, when you want. Our 5th floor condo faces west with a full ocean view from every room and Lanai. It's above the palm tree line with no obstructions. Underground parking is available and accessible with your room key. High-speed fiber optic WiFi Internet service (300x300 Mbps). Located in the Konea tower on ground level, it features separate weight and cardio rooms. Convenient - elevator lobby is directly across the hall from our condo. SubZero refrigerator with bottom freezer and ice maker. Assortment of various books left by previous renters and a Maui Revealed travel book. A variety of beach toys are usually available in the room (we ask guests to replace toy they break) ... boogie boards, sand toys, beach chairs, etc. within 2 years and it was just as beautiful as we had remembered. We had a multigenerational group celebrating a milestone birthday, and it was perfect for everyone to have their own space yet also enough room for everyone to gather. Everyone appreciated the comfortable beds and linens. We used the outside grills for for the first time and it worked out really well. We were really delighted to see whales from the lanai almost every afternoon. Our young children enjoyed the pools even more than last time, and our 5 year old appreciated finding some boogie boards in the closet. The owners provide an additional concierge contact and any questions were answered professionally and promptly. We really enjoy the spirit of Honua Kai and it's a great place for families as well as adults. We will be back again! The condo was the best. My family enjoyed the trip. The condo had everything you need to make your vacation the greatest. We hope to go back again soon. Great condo and great location! Thank you Chris for sharing your beautiful condo with our family and providing so many extras for your guests. We hope to return in the near future. Thanks Chris and Mike for allowing us to share your beautiful place in paradise. We made some precious memories together with our family in Maui, that will last a lifetime! Such a magical place. We loved getting up every morning to check on the whales passing through, very special watching them breach and frolic in the ocean, while sipping a cup of coffee from the lanai! Chris thanks for all your pre~planning advice and help to make the best choices in our adventures! We all loved our stay and hope to return someday! 3 adult couples, have been traveling together 3-4 times per year for 30+ years, had a wonderfu time. This was the most amazing vacation stay at Honua Kai! Location and condo were excellent! We cannot thank Mike and Chris enough for the amazing experience we had staying in there beautiful, spacious and very clean condo! The location of the condo in the resort was perfect, the views were phenomenal and the resort itself was excellent! The location of our condo was perfect as it was right in the middle of the resort and right next to the elevator for easy access. The condo is fully stocked with everything imaginable to make it feel like you were at home... and then some... coolers, beach chairs, snorkel gear, umbrellas...you name it it was there! We highly recommend unit 525 and will definitely be back with our family and friends in the future! A beach walk in front of the resort connects North and South Ka'anapali beach areas. It's a lovely ocean view walk to Whalers village with places to eat along the way including the fabulous Dukes Beach Grill on property.